I'm not one of those people who create, design and plan their Halloween costumes far in advance. I'm lucky if I visit the costume shop for inspiration--or a cheap purchase--days before October 31. But even with costume procrastination, I can list dress-up suggestions, original or basic, for whatever fete lands on the calendar. Except ask me to devise, or even don, a costume for a running race, and most of my ideas go out the window. Why? Because they're all fitness-based and they don't seem all that original, unique or even costume worthy when you're dressed like nearly everyone else. Nor would they be easy to run in, a key component to any costume that I'd be likely to wear (I'm not out to win any costume awards at the races but I am a PR seeker). And for reason No. 3, any of the good costumes--an Indian chief, sock hop gal, Goofy and the Statue of Liberty--were costumes I wore before ninth grade and if they are still in existence, they are 300 miles away. All things considered, I should have begged my sister to write about costumes conducive to running and share her knowledge from working wardrobe in theater productions. I might be creative with words but she has me beat hands down in the hands-on department. Instead, I'm going to have to rely on my own costume intuition for these 10 outfits. Richard Simmons. Sure, you want to stray away from the workout attire when you're going to be running in costume, but can you really pass up the chance to wear Simmons' signature red tank and near-booty shorts? Add a curly top wig and you're set. U.S. Postal Service worker. 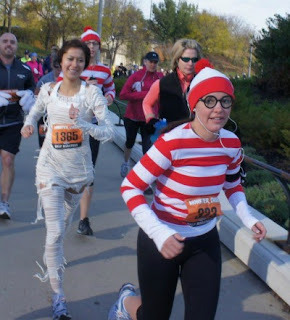 The postman runner flew right past me during the 2011 Chicago Marathon, and as he did, I noted his costume ingenuity. The shorts, the short-sleeve shirt, the round hat worn by many mail men and women who walk the streets to deliver mail, this outfit was practically made for running. Now I probably couldn't carry it off, package included, for 26.2 miles, but absolutely for a shorter distance. Batman. Get passed by a super hero once, be the super hero next time. Batman sped right by me and immediately I wanted a mask and cape. A farmer. Dig out an old flannel, find some overalls and a straw hat. Not only do you have a comfortable costume, but you can find most of the items in your own closet or a second-hand store. A doctor. Scrubs and a stethoscope anyone? If you have these familiar green or blue pants and shirts on hand, it's almost too easy to pull this costume together. Yet sometimes when it's right in front of you, in my case, you forget until after the fact--and then reassure yourself that you didn't want to spend the 5K pulling up your too-big pants anyway. A football fan. You can make your game day attire run ready, just wear your jersey, running tights and dig out your white compression socks. Now if only my Boomer Esiason jersey wasn't sitting in a closet in Michigan, I could have resurrected it for the Halloween races. A skier. I can't claim originality for this costume: a runner wore it earlier today at the Trick or Treat Trot. Except his was cooler than anything I could pull out of my closet since it paid homage to the 1980s with the neon goggles, bright jacket, tight pants and furry boots. Waldo from Where's Waldo? Striped socks, striped shirt, black-rimmed glasses, blue shorts, this costume is easier to put together than I originally thought. Wonder Woman. Ladies, you didn't really want to dress like Batman so here's the female version. This costume might require a trip to the costume store, but it's one that can be worn again and again without much complaint. You have super powers, aka awesome running legs or legs that like to run, so show 'em off. Papa Smurf. Green spandex suits have been done. So has painting the body neon orange (a fast marathoner). But what about going a little Blue Man Group with a touch of 1980s cartoon heaven. Paint your body blue, find some red bottoms, dig out a Santa beard, and you'll shout Papa Smurf. Well, almost. You still need to track down his signature Smurf hat, but that can't be too hard--I saw an entire troop of Smurfs Saturday night and I'm sure one of them left a hat behind at the bar. Or grab a Santa hat and paint the white parts red. If you think it's tough coming up with a costume to run in, it's even more difficult to find one for skiing--what can you layer over your winter layers and what can withstand a day on the slopes? At least you have until closing weekend in April to decide on those costumes, unless you're planning to hit Arapahoe Basin, or one of a handful of open resorts, this Halloween. What are your costume suggestions? Photo grabbed from Dave Mari. Thanks so much for the comment, we really appreciate the feedback and reading! This post is really very useful for easy outfit.This post provided so much interesting idea for women outfit. Thanks Zombie Costumes! If you have more costume ideas, please share!